Craft - Los Angeles | Bentel & Bentel Architects/Planners A.I.A. CRAFT LA, LOS ANGELES, CA - This restaurant for the chef Tom Colicchio, our fourth in a series of six Craft projects, again allowed us to experiment with a limited set of architectural materials and the simplest craftsmanship required to join them to create interior spaces that directly relate to the chef’s approach to cooking. He firmly believes that cooking of any kind is a craft, not an art. He uses the highest form of uncomplicated culinary craftsmanship to explore the full flavor of each farm-raised ingredient on the menu and serves these unadorned on separate plates at the center of each table for all to share. Within the parameters of our design approach, we had to address the chef’s desire for 275 total seats, including a 40 seat private dining room, a 75 seat outdoor terrace, a 1000-bottle wine case and a 3,500 square foot kitchen. Unlike the static expressions of the Craft ‘character’ exhibited in it’s logo and typeface, where the iconography and imagery emphasize consistency between each restaurant, we set ourselves the additional goal of evolving the patrons’ experience of our other Craft restaurant designs without replicating those designs. Our approach, as before, drew on the context as a means to integrate our design both functionally and metaphorically with the food and service practices of the restaurant. Here, the Century City context included a new two-story aluminum and glass building with a terrace overlooking a lushly planted park at the center of a recently refurbished office and cultural super-block. The muscularly curved shape of the one-story floor-to-ceiling glass wall of the existing building overlooks the terrace and dominates the interior. We translated the raw ingredients of sinuous plan shapes by rotating them vertically to form continuous fabric covered tent-like ceiling and wall panels that swathe the main dining room. 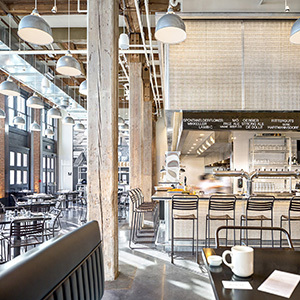 Two straight planes set perpendicular to each other – a standing-seam bronze wall and a blackened steel and glass wine case – help define the major interior program areas of bar, main dining, and private dining rooms. Existing columns clad in sandblasted bronze plate punctuate and anchor the patrons’ experience of the main dining room. The patrons’ sensual appreciation for these materials deepens through visual and tactile comparison of the materials that make up each element. For instance, the taut fabric-clad tent-like panels in the dining room accentuate the stout mass of the sandblasted bronze columns. Elsewhere, the cool crisp transparency of the steel and glass wine case is balanced by the warm old-growth white oak flooring and custom-designed teak and walnut millwork that populates both the interior and exterior spaces. Throughout the spaces, all furnishings and fittings were designed by us to celebrate their materials and the elegantly simple craftsmanship used to assemble them. These materials are intentionally left unprotected to encourage natural variations in surface texture and color induced by age and use.